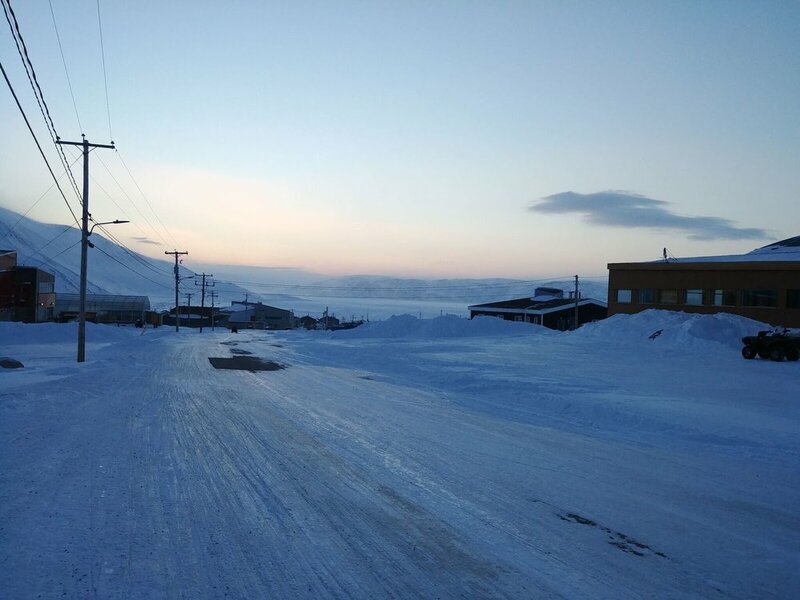 This morning in Kangiqsujuaq there was a storm a brewing. Strong winds and swirling snow! 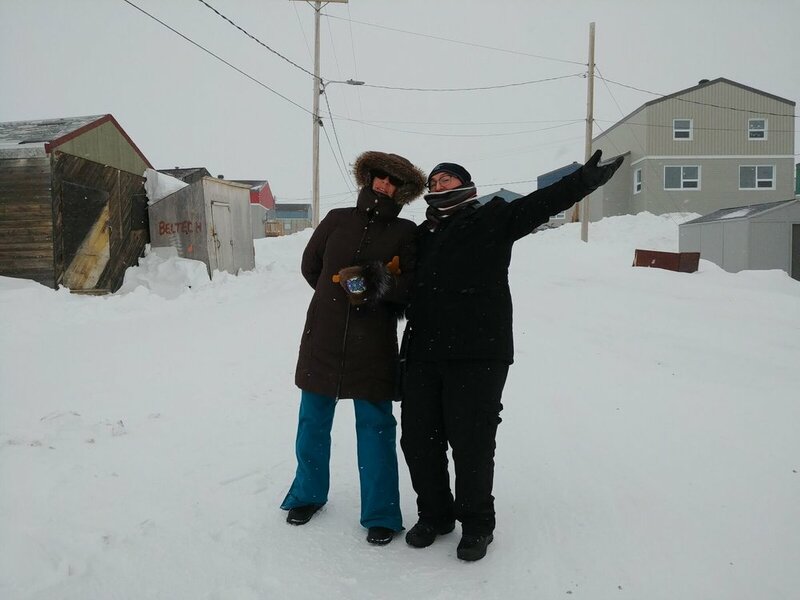 All suited up us mentors brave the wind to visit Wakeham Bay. It is an overcast day so everything is white on white. Dogs says hello and folks on four wheelers photo bomb! At the Northern Store we pick up juice, paper towels and spoons for the screening! Then it is back to meet Nigel so he can work on his finishing touches. Nigel checks his sound sync scenes and adds more b-roll. He is in such a good place with time to really get picky. He records his Uncle Mark for a sound track - a little instrumental guitar. Mark, BTW, is outside again completing his igloo!!! Mark also called the radio station to advertise for the screening! Glenn puts together the community kaleidoscope animation with sound and credits. Nigel adds final credits and decides to ask Mark again to make some melodic sounds for the end of his film, just for punctuation. By 3 o’clock Nigel is DONE! A personal and powerful film about getting past the extreme sadness of bullying, racism, suicide, murder and the loss of friends and brother. To have such a vision from the start and work hard to reach this goal in an effort to heal your self and help others. Bravo Nigel! Then it is set up for the screening. Ned so kindly is our 'guide' and he brings over water, sets up the chairs, makes coffee and opens the door. He even covers the window with garbage bags! Elaisa bring delicious Caribou Stew, bannock, arctic char on crackers and berry tarts for the dinner! And Elders start arriving right at 5! Mark comes in from making his igloo, Leena and Ned and Nigel all attend. We start the films at 5:30, since we have a full house! 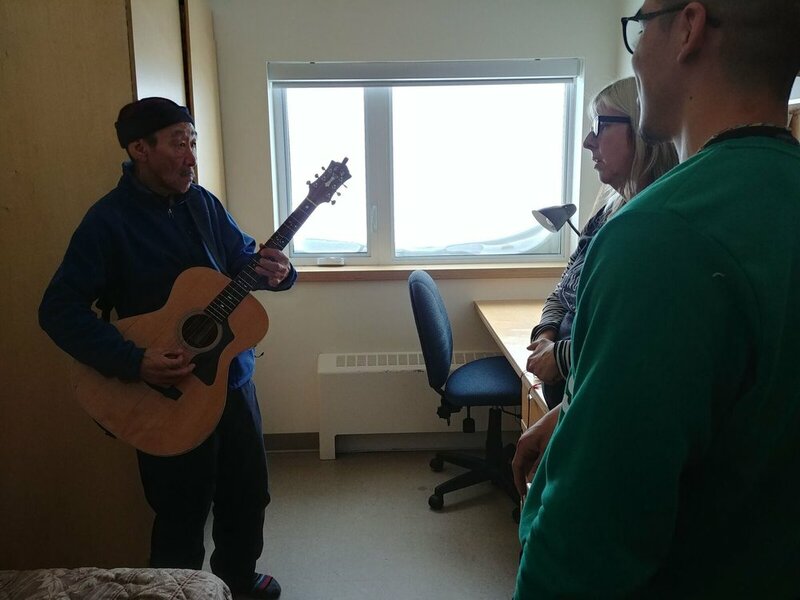 Nigel makes an introduction in english and Inuktitut and his grandmother says a prayer. Nigel has 3 members of his family attend. So many people heard about the screening from the radio! The films are amazing to see on the big screen! The Elders have important comments about wishing the films were in Inuktitut and mention they were hoping to see more archival type content. Luckily Mark’s song and Jaiku singing in Leena's piece was in Inuktitut but both Nigel and Ned’s films were in english. We are already hatching a plan to return in order to incorporate Elder voices and the Inuktitut language! This is exactly the reason for multiple visits. To build on connections and friendships and try to accommodate the dreams of the community to tell stories! When more folks show up, we have a second screening!! Such a great response! Back at the residence the films are output with the approved credits and each filmmaker receives their film . Because the internet is so slow, we make a plan to post films online, asap, upon return to the south and west, and submit immediately to Montreal First People’s Festival. The filmmakers feel proud of their work! Ned and Leena and Nigel and Lisa and Courtney and Glenn sit around and laugh. SO happy that we all could meet!